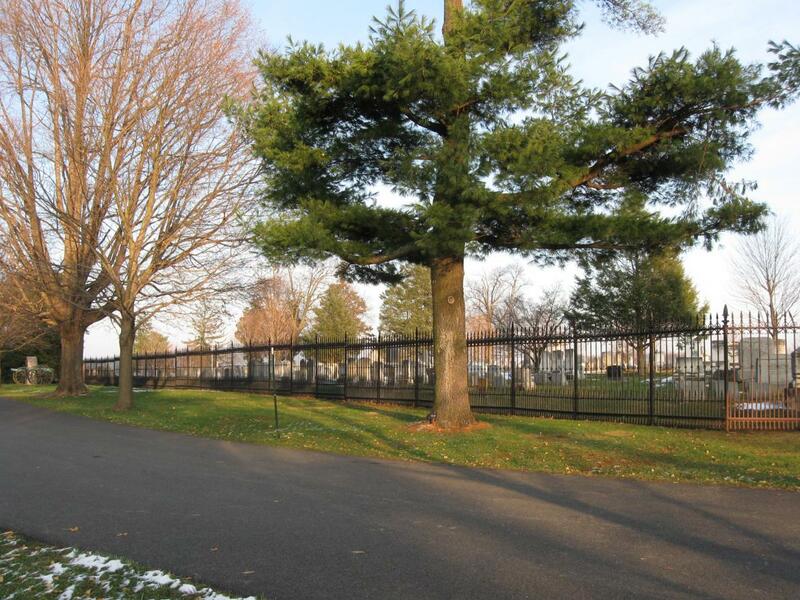 Work on the Sickles Witness Fence that separates the National Cemetery from Evergreen Cemetery has is approximately two-thirds complete. 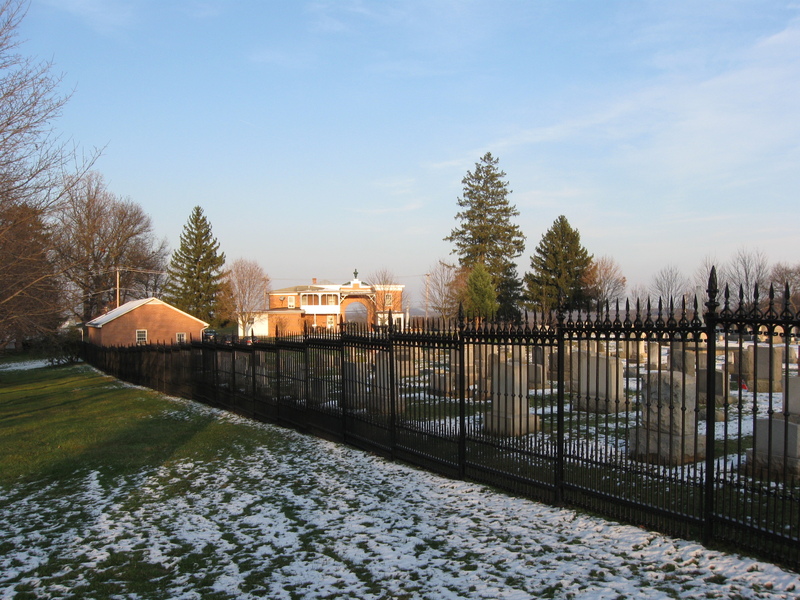 The Evergreen Cemetery Gatehouse is the brick structure in the center background. The Evergreen Cemetery maintenance building is the brick structure in the left background. This view was taken facing northeast at approximately 4:00 PM on Sunday, December 6, 2009. 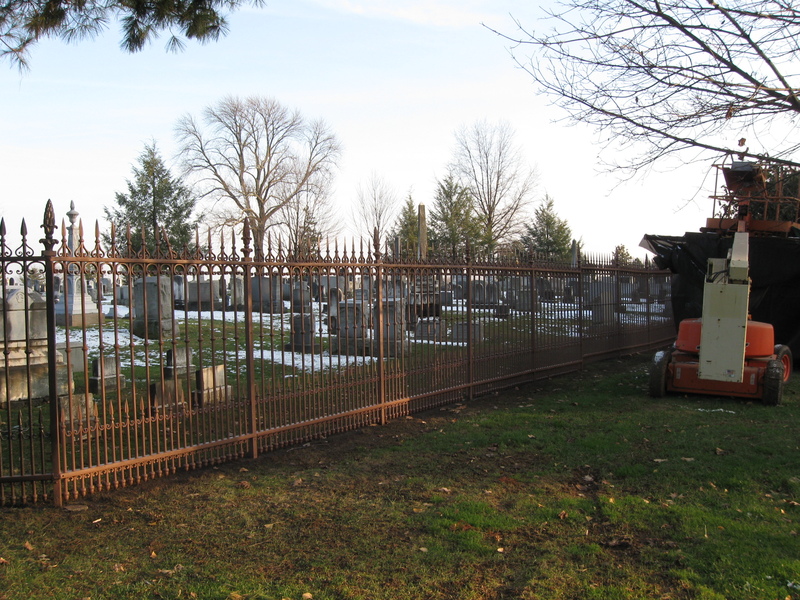 Work on the Sickles Witness Fence separating the Soldiers National Cemetery from the Evergreen Cemetery continues at a very slow pace. The second group of contractors, who were hired in August, are approximately two-third finished. 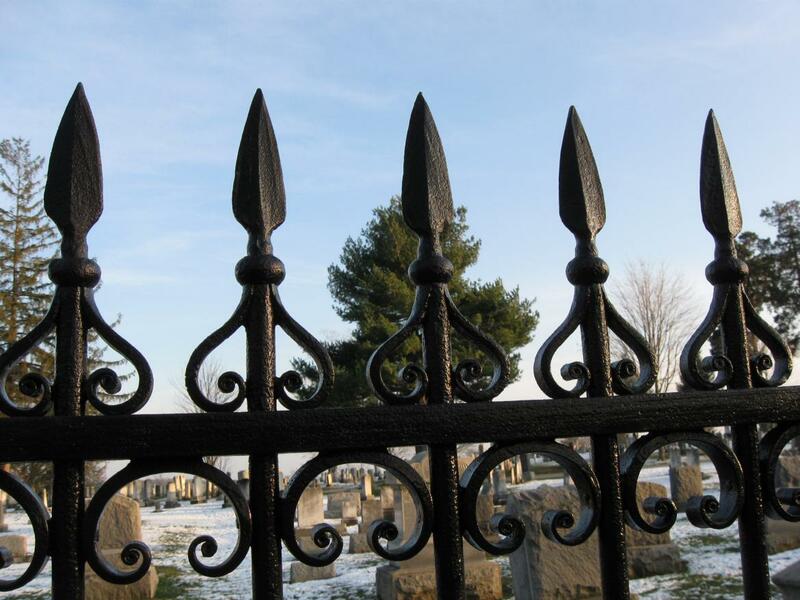 We’ll take a walk along the fence and show you some of the progress. We’ll begin our walk at the Taneytown Road entrance to the National Cemetery. This view was taken facing east at approximately 4:00 PM on Sunday, December 6, 2009. 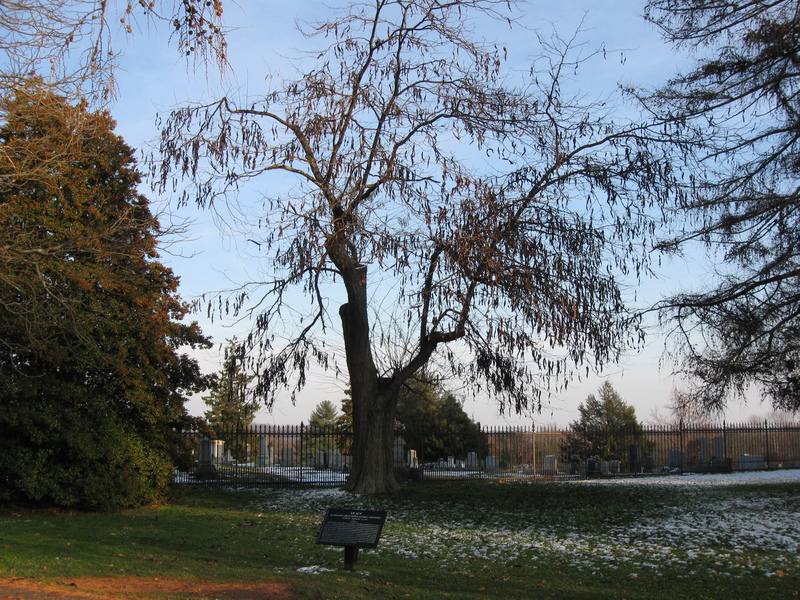 Here is the honey locust “witness tree” struck by lightning last year. The fence behind it has not been worked on yet. This view was taken facing east at approximately 4:00 PM on Sunday, December 6, 2009. 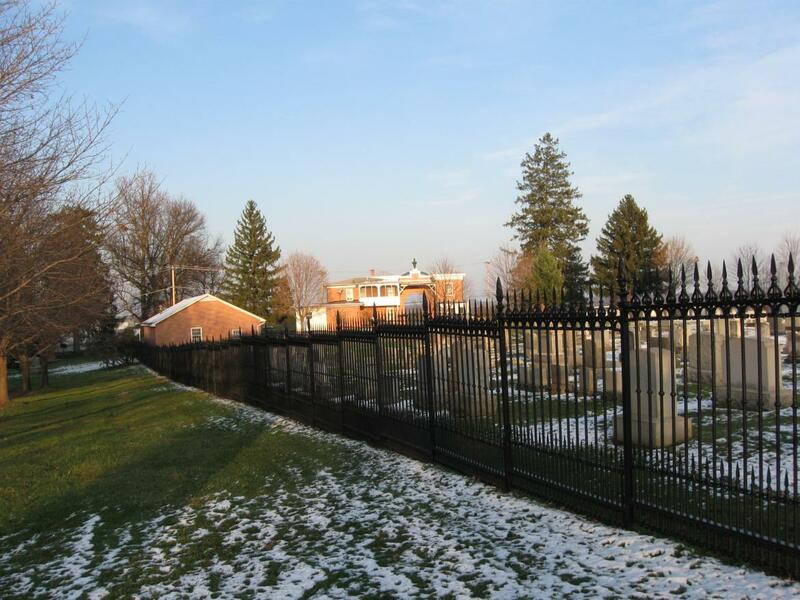 Work hasn’t yet reached Huntington’s Ohio Battery, but progress is just ahead. This view was taken facing north at approximately 4:00 PM on Sunday, December 6, 2009. 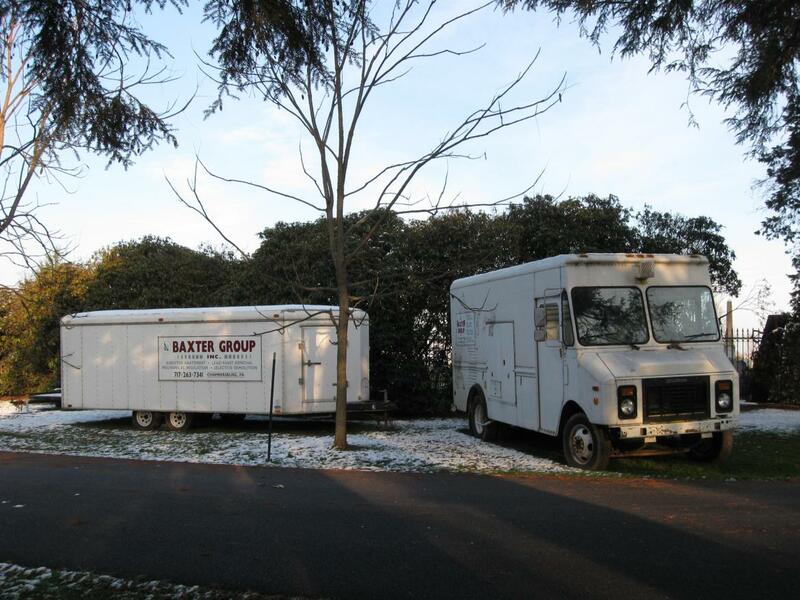 The Baxter Group is from Chambersburg, Pennsylvania. This view was taken facing east at approximately 4:00 PM on Sunday, December 6, 2009. 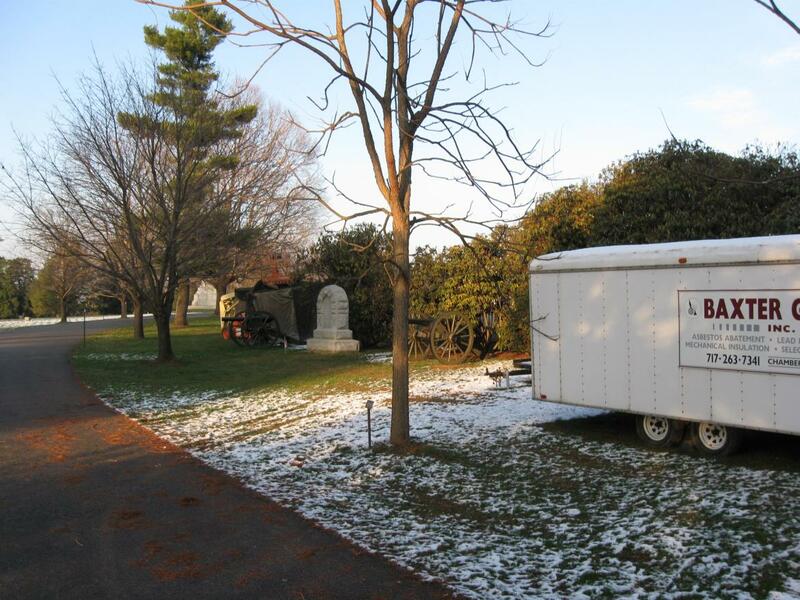 The area in which the trailer is located…This view was taken facing northeast at approximately 4:00 PM on Sunday, December 6, 2009. 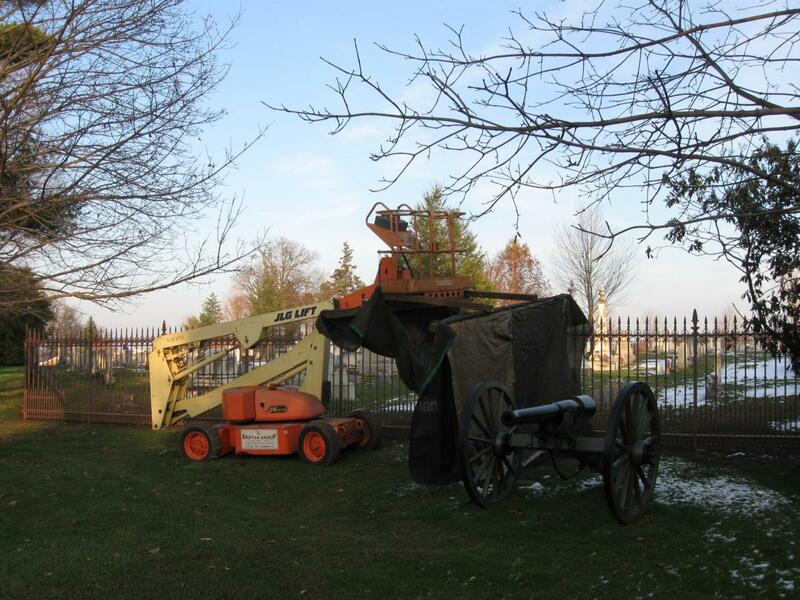 …is the site of a West Virginia battery. This view was taken facing northeast at approximately 4:00 PM on Sunday, December 6, 2009. 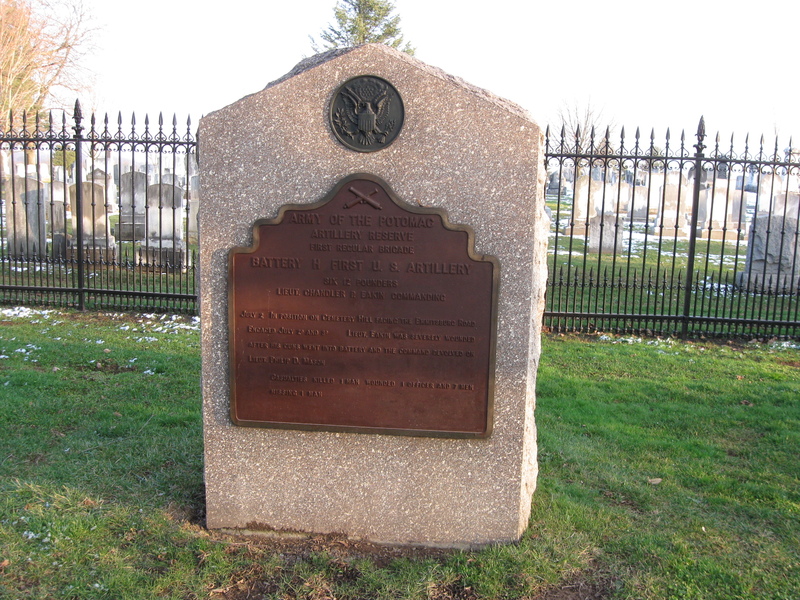 Battery C, First West Virginia Artillery was commanded by Captain Wallace Hill. 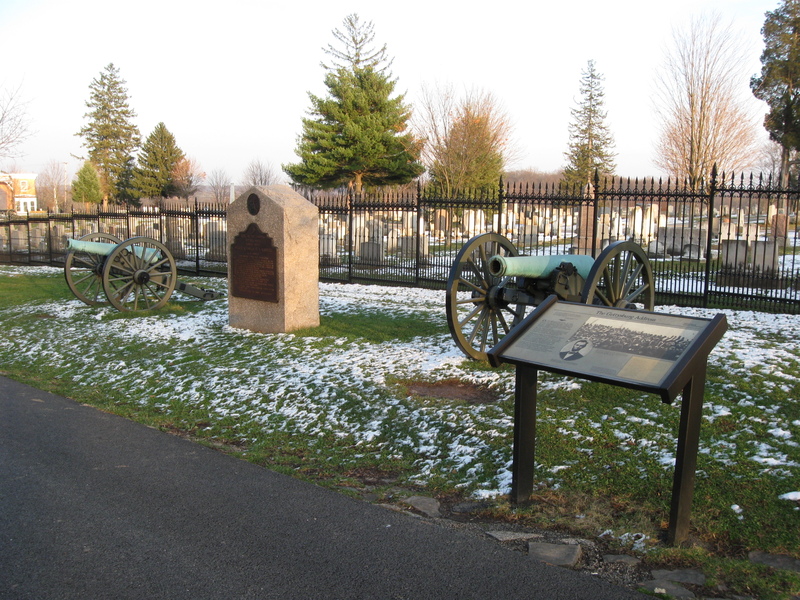 They had two men killed, two men wounded, five horses killed, and expended 1120 rounds of ammunition from their position on Cemetery Hill. This view was taken facing east at approximately 4:00 PM on Sunday, December 6, 2008. 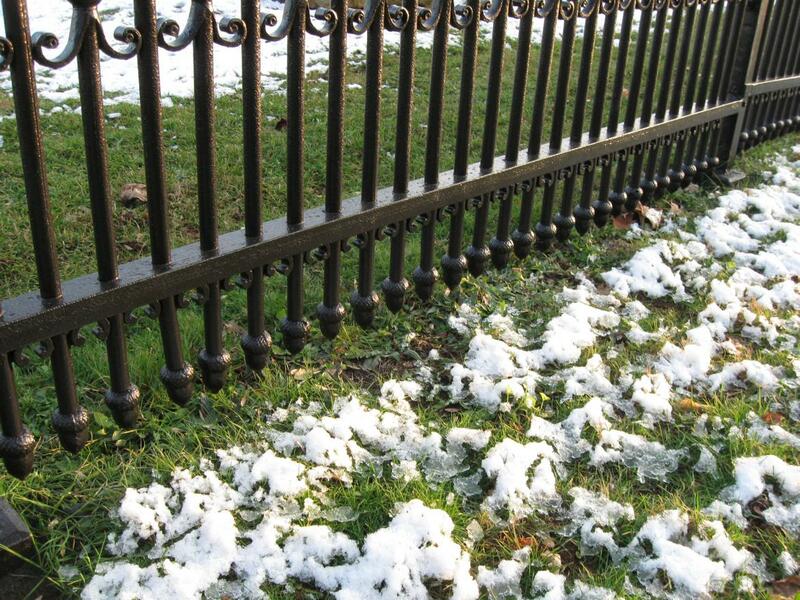 The metal pieces are to help keep any foliage, or other items harmed while the stripping of the fence occurs. This view was taken facing east at approximately 4:00 PM on Sunday, December 6, 2008. Some other equipment. This view was taken facing northeast at approximately 4:00 PM on Sunday, December 6, 2009. 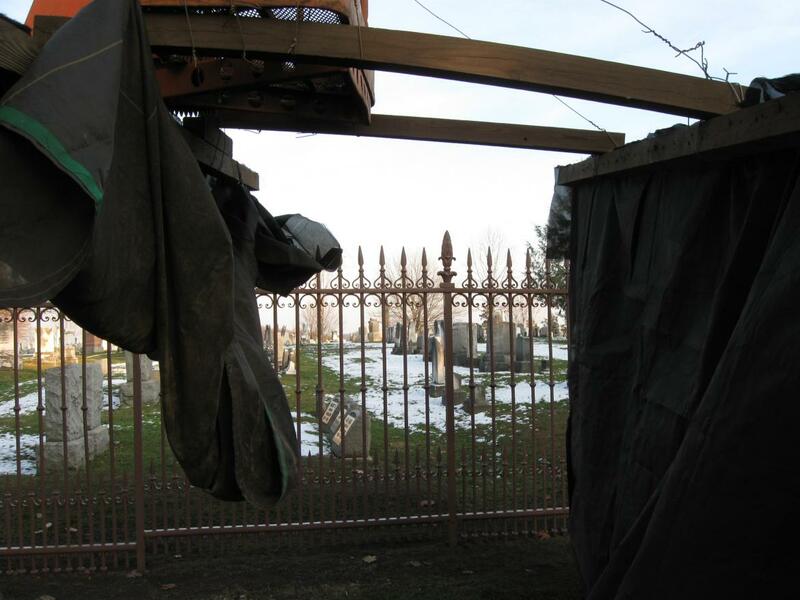 We’ll go between the tarps… This view was taken facing east at approximately 4:00 PM on Sunday, December 6, 2009. 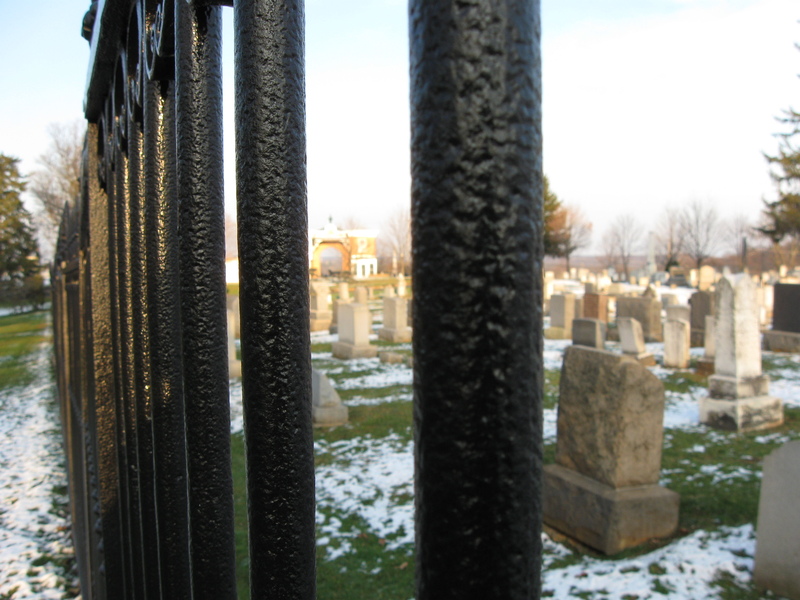 …and see that this part of the fence has been stripped and primed with one of its first coats of paint. This view was taken facing east at approximately 4:00 PM on Sunday, December 6, 2009. 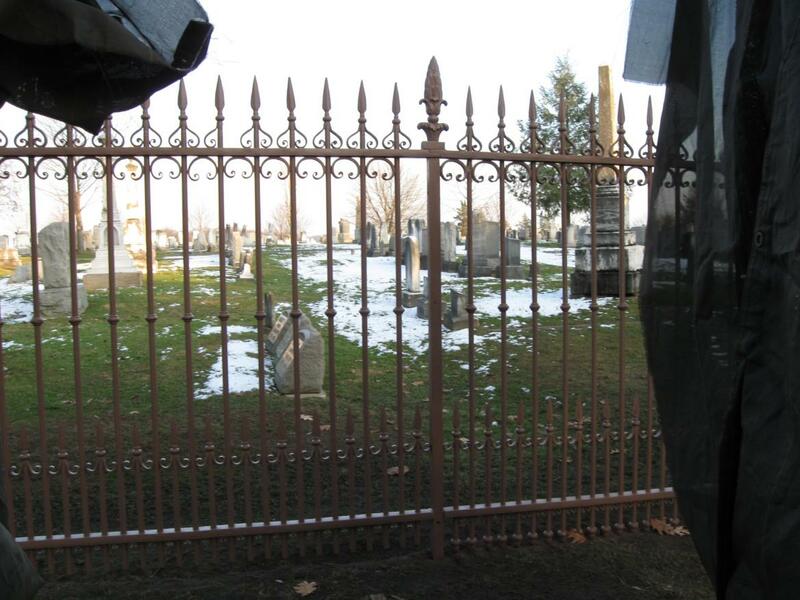 We’ve reached the section of the fence where the primed part of the fence runs to the left or north. Now it meets a part of the fence that has been painted. This view was taken facing southeast at approximately 4:00 PM on Sunday, December 6, 2009. This section of the fence runs to the northeast to the Baltimore Pike. 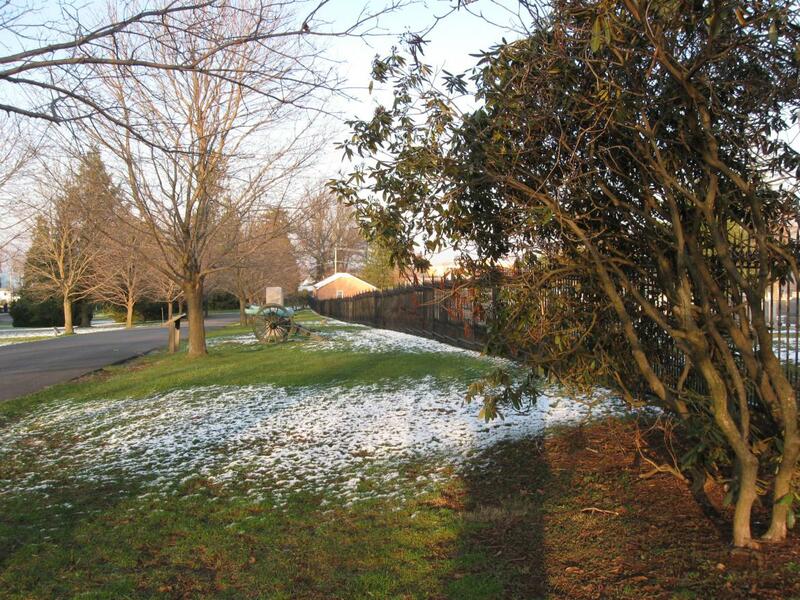 This view was taken facing northeast at approximately 4:00 PM on Sunday, December 6, 2009. The rest of the fence has not been painted however. This view was taken facing northeast at approximately 4:00 PM on Sunday, December 6, 2009. As we approach Eakin’s Battery…This view was taken facing northeast at approximately 4:00 PM on Sunday, December 6, 2009. …which by the way, someone has stripped the plaque here… This view was taken facing east at approximately 4:00 PM on Sunday, December 6, 2009. 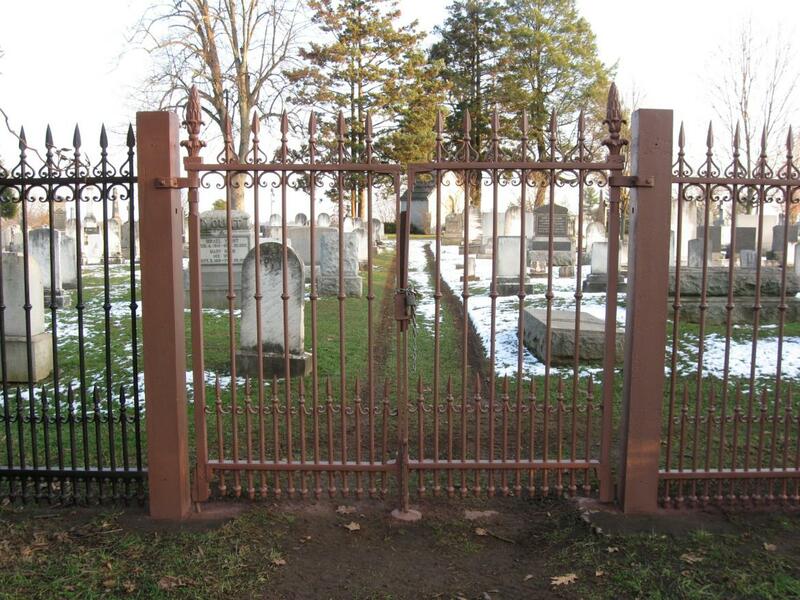 You’ll notice the fence goes back to its brown primer. This view was taken facing northeast at approximately 4:00 PM on Sunday, December 6, 2008. 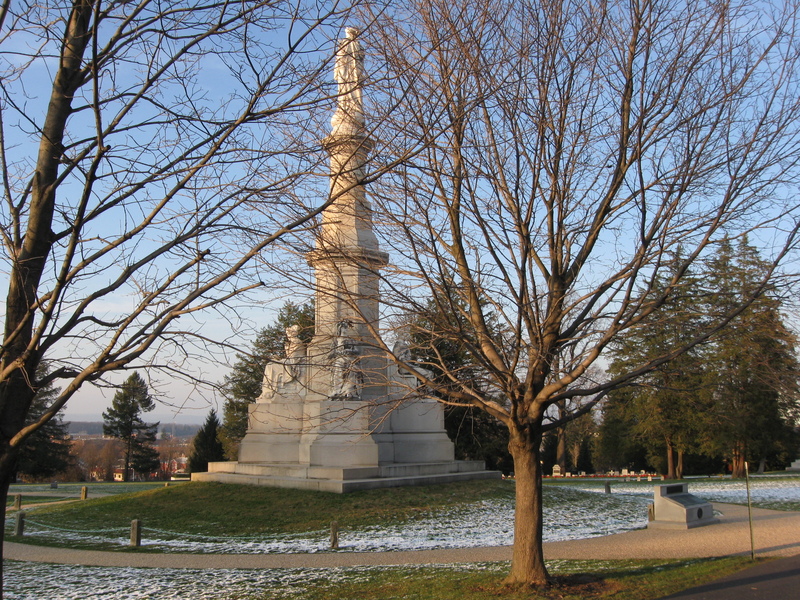 We’ve now reached the area of the Soldiers National Monument… This view was taken facing north at approximately 4:00 PM on Sunday, December 6, 2008. 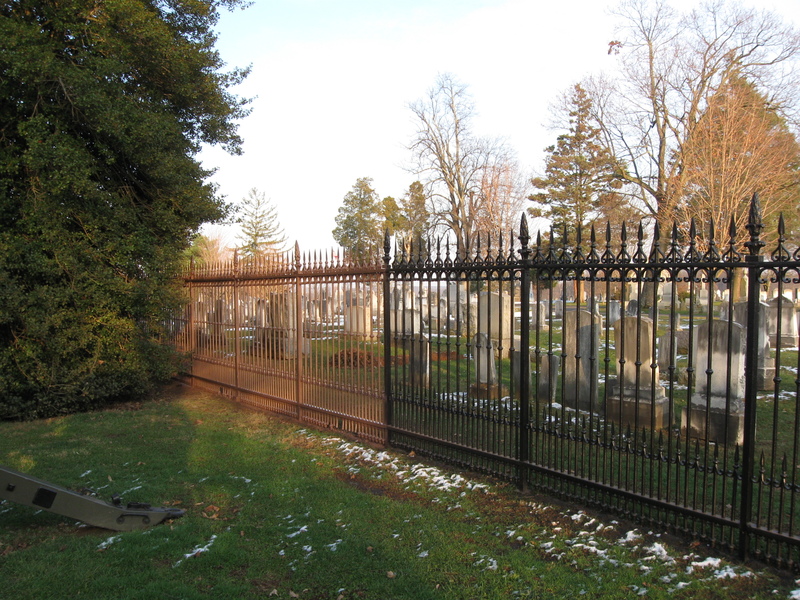 …and the gate that leads to Evergreen Cemetery and the Brown Vault in the center background. The black paint begins again to the left of the gate. This view was taken facing southeast at approximately 4:00 PM on Sunday, December 6, 2009. We’ll continue walking for a little while. This view was taken facing northeast at approximately 4:00 PM on Sunday, December 6, 2009. 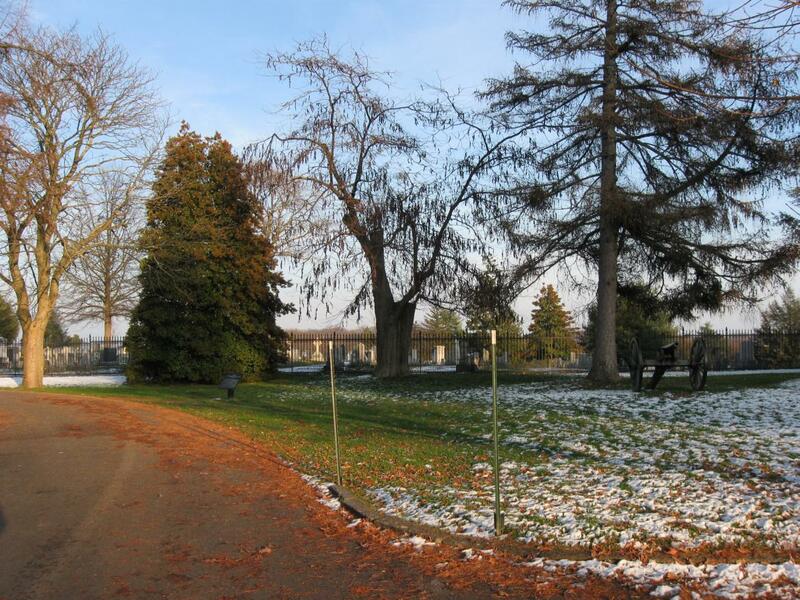 The Evergreen Cemetery Gatehouse is in the center background. This view was taken facing northeast at approximately 4:00 PM on Sunday, December 6, 2009. 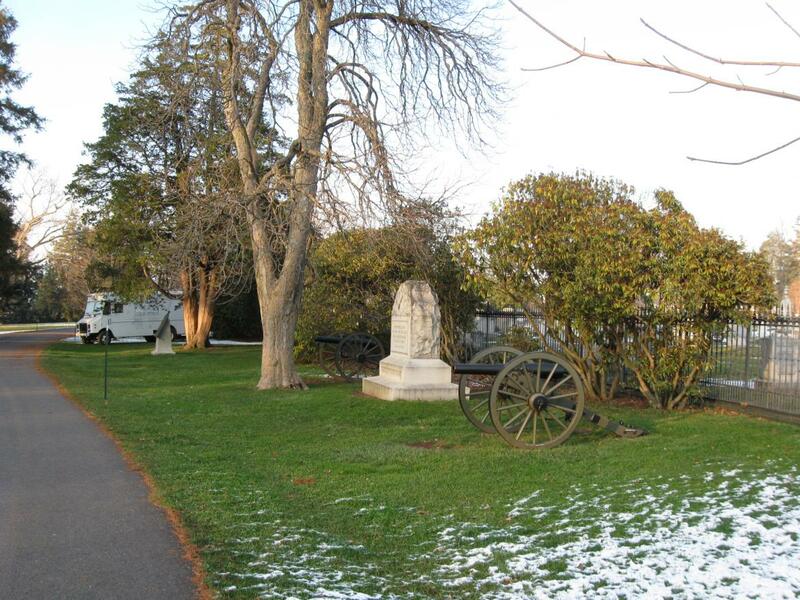 We’re in the area of Bancroft’s Battery. This view was taken facing norheast at approximately 4:00 PM on Sunday, December 6, 2009. Again the plaque has been primed. This view was taken facing east at approximately 4:00 PM on Sunday, December 6, 2009. 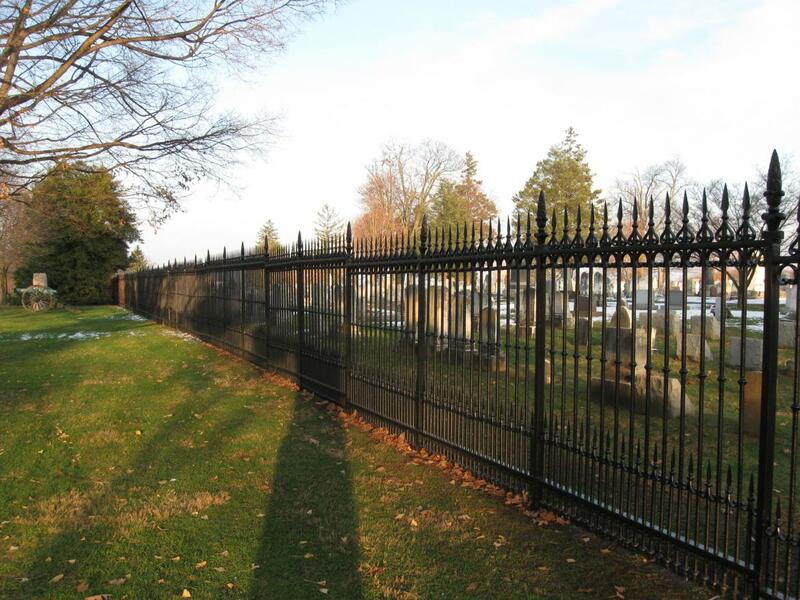 We do want to take a closer look at this fence which used to be across the street from the White House surrounding Lafayette Park. This view was taken facing northeast at approximately 4:00 PM on Sunday, December 6, 2009. As we look at the gatehouse, look how the iron has become pitted. 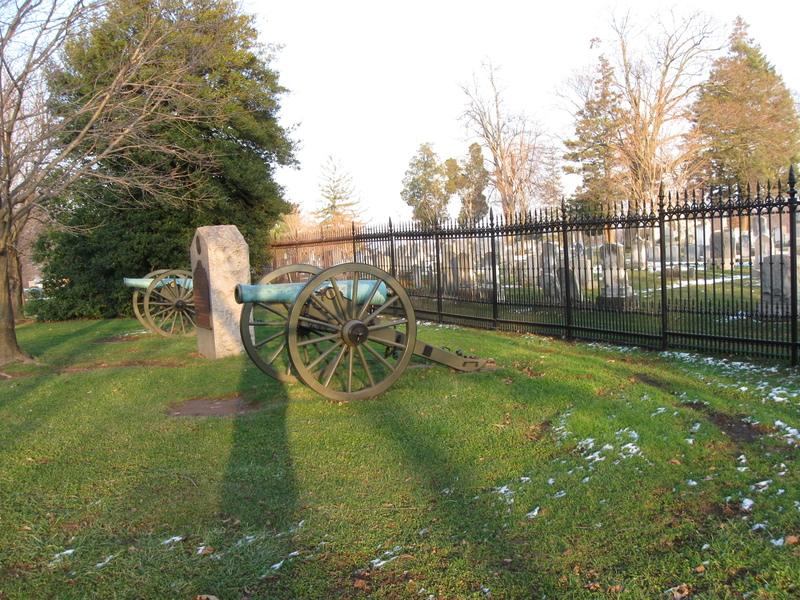 Of course it was over 150 years ago that Daniel Sickles shot Phil Barton Key near this fence. This view was taken facing northeast at approximately 4:00 PM on Sunday, December 6, 2009. Look at the other details. This view was taken facing east at approximately 4:00 PM on Sunday, December 6, 2009. It certainly took some time to paint and strip these items correctly. This view was taken facing east at approximately 4:00 PM on Sunday, December 6, 2008. 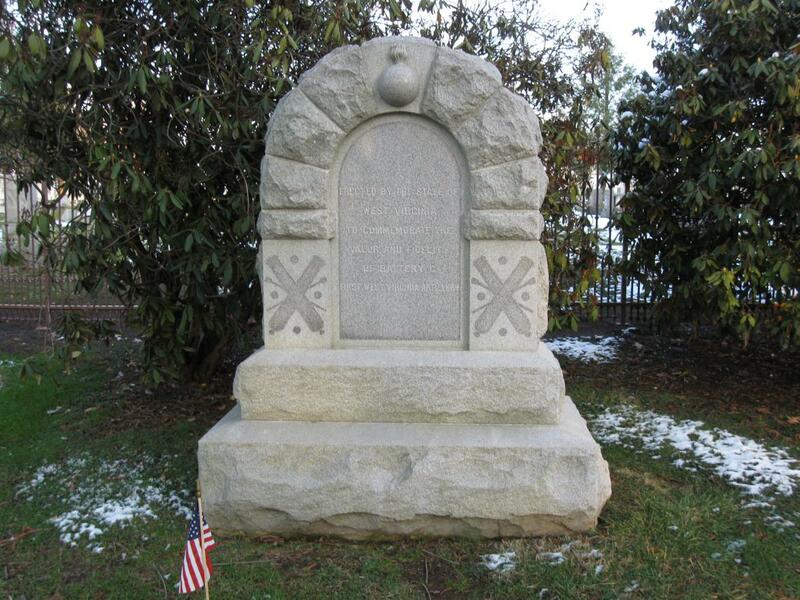 And who would have known that the greatest Corps (14th) of the best Union Army (Army of the Cumberland) would have their Corps Symbols on display here. 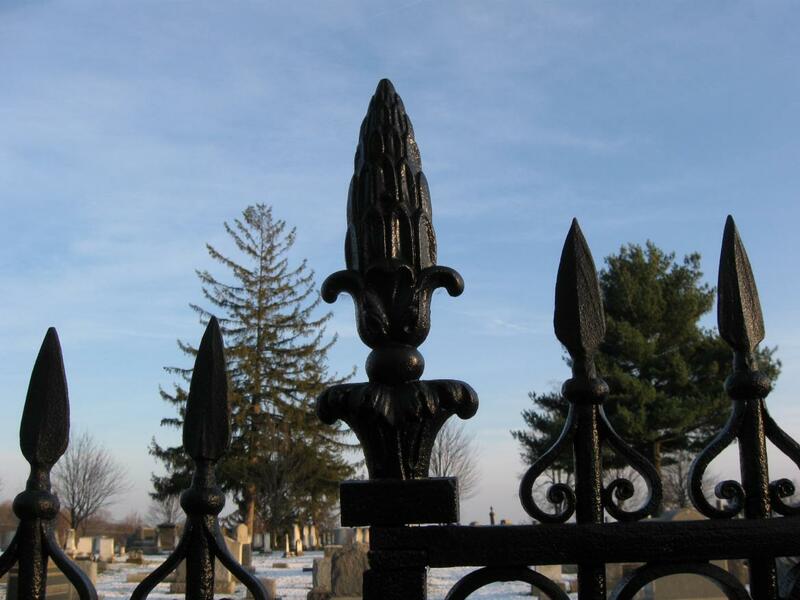 The acorns show that George H. Thomas’ (greatest General during the Civil War) XIV Corps stood “solid as an oak.” This view was taken facing southeast at approximately 4:00 PM on Sunday, December 6, 2008. 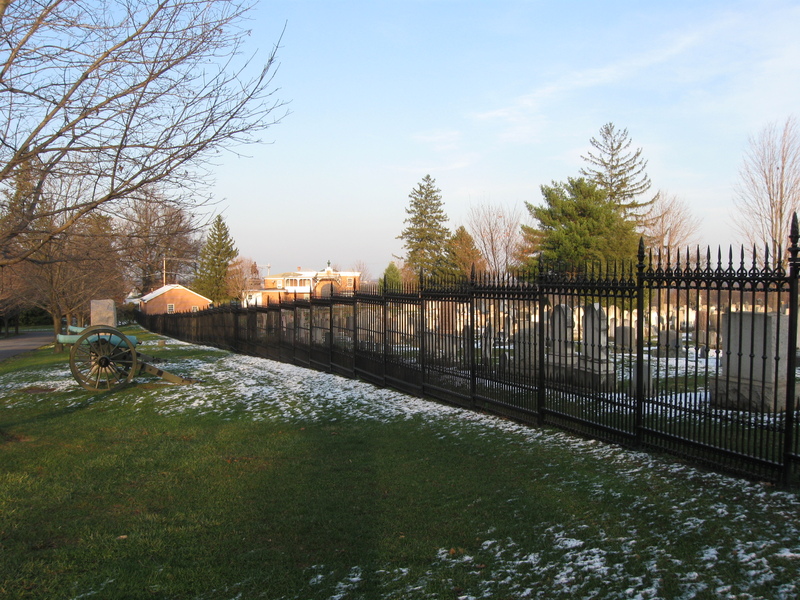 The fence is completed from here to Baltimore Street/Baltimore Pike. This view was taken facing northeast at approximately 4:00 PM on Sunday, December 6, 2009. Ok, we’ll look at the fence facing the other direction. 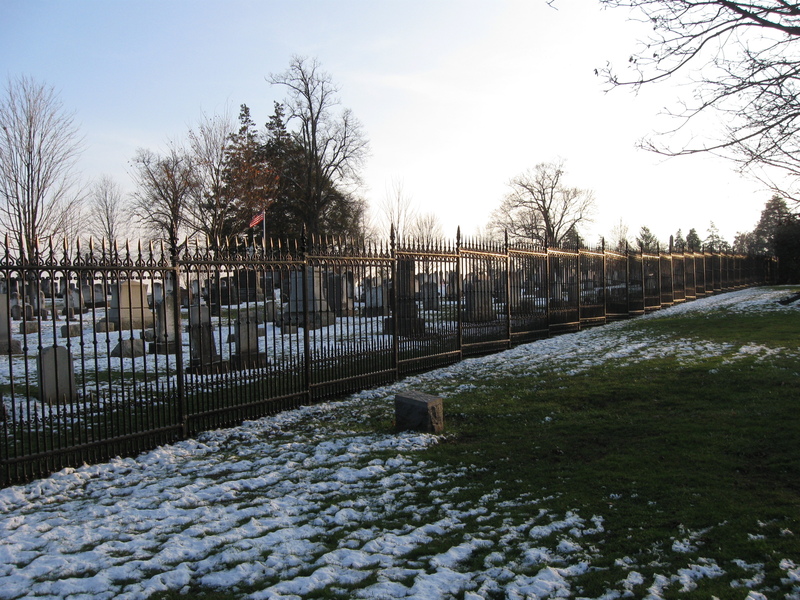 The American flag marks Jenny/Jennie/Ginnie Wade’s grave in Evergreen Cemetery. This view was taken facing southeast at approximately 4:00 PM on Sunday, December 6, 2009. 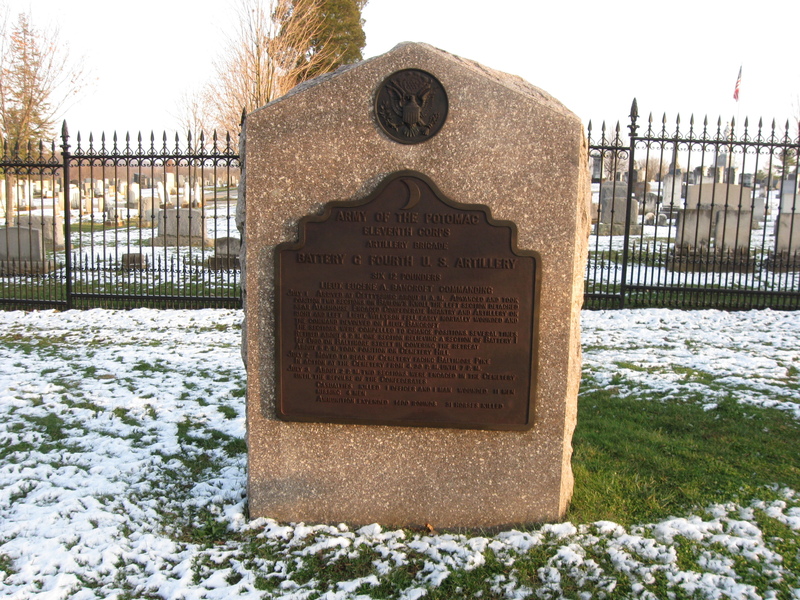 The Confusing Gettysburg Address Memorial on May 16, 2008. Memorial Day Weekend Flag Decorations on May 25, 2008. National Cemetery Walk on July 14, 2008. 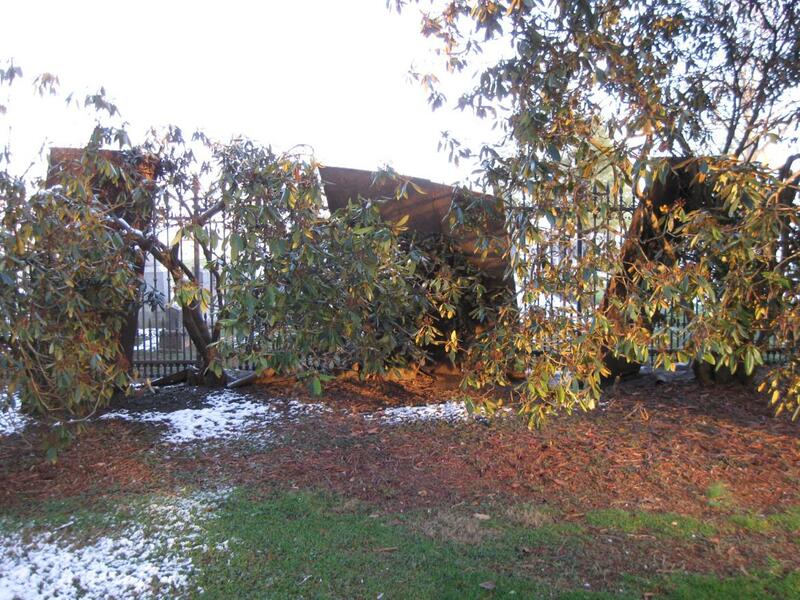 Gettysburg Witness Tree Damaged in Soldiers National Cemetery on August 10, 2008. Gettysburg Witness Tree and Sickles Witness Fence Damage on August 12, 2008. Gettysburg National Cemetery Christmas Wreaths on December 9, 2008. 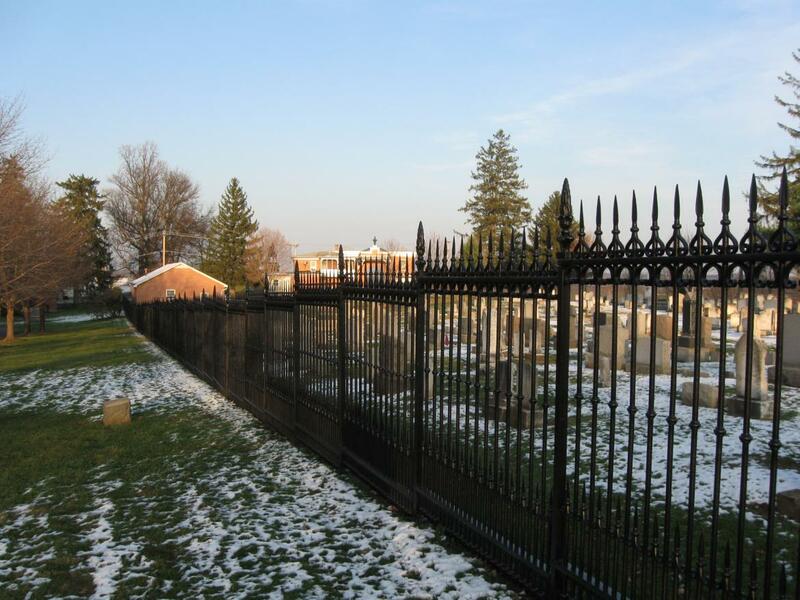 Gettysburg National Cemetery Fence and Sickles Witness Fence Update on June 20, 2009. Flags Placed in the Gettysburg National Cemetery for the 146th Anniversary on July 1, 2009. Gettysburg National Cemetery Part 1 with LBG Roy Frampton on July 23, 2009. Gettysburg National Cemetery Part 2 with LBG Roy Frampton on July 30, 2009. Gettysburg National Cemetery Part 3 with LBG Roy Frampton on August 7, 2009. Gettysburg National Cemetery Part 4 with LBG Roy Frampton on August 21, 2009. National Cemetery Baltimore Street Entrance Gate Restored and Repainted on September 1, 2009. Sickles Witness Fence Work Begins Again with New Contractor on September 6, 2009. Gettysburg National Cemetery Part 5 with LBG Roy Frampton on September 7, 2009. 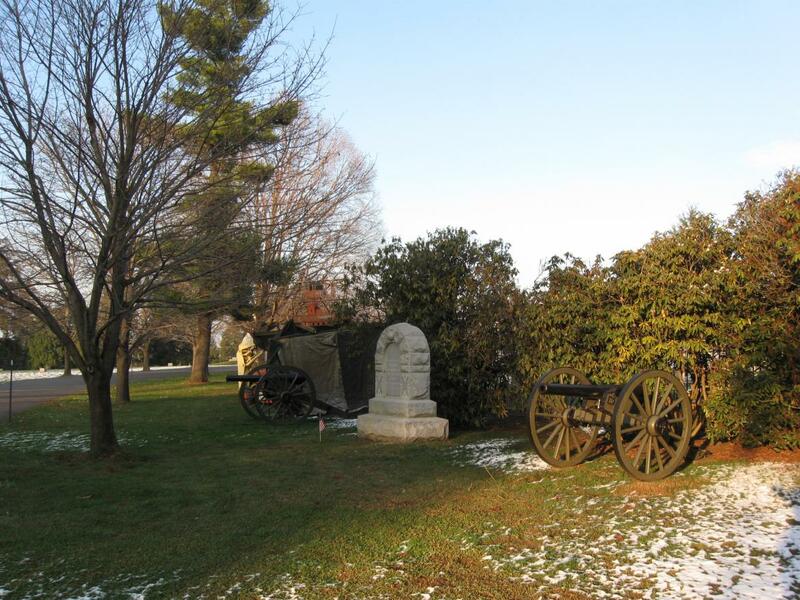 Gettysburg Soldiers’ National Cemetery Christmas Wreaths 2009 on December 7, 2009.